Dungeons and Dragons is a role-play game – a game of the imagination – so most of the action goes on inside your head; however, in a big, confusing battle visual repressentation can be useful. Among other things, it stops the characters from spontaneously teleporting from one side of the room to the other (without the use of a spell)! Aside from that it’s nice to see what you’re up against once in a while, to react in genuine horror as the GM reveals the hideous visage of the monster you have to fight (even if it is only 3cm high). But miniatures are expensive, right? WRONG! You’ve got a piece of paper haven’t you? 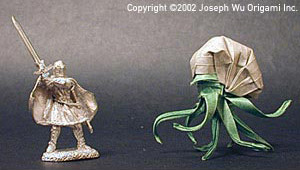 Well then – get folding and you can have your very own miniature army for mere cost of a bajillion papercuts! I’m frequently impressed by the skill and imagination of the crafting community – it’s not all scarf-knitting and pillow embroidery. They come up with some damn cool stuff, made even more special by the fact they’re often one of a kind. And now we have Origami Miniatures, by Jingo (or, more accurately, by Wu)! Just look at them: they are amazingly detailed. So simple… yet so complex! I can’t even begin to imagine how someone could make something like this. It’s like the mystery of the Pyramids to me. Amazing. 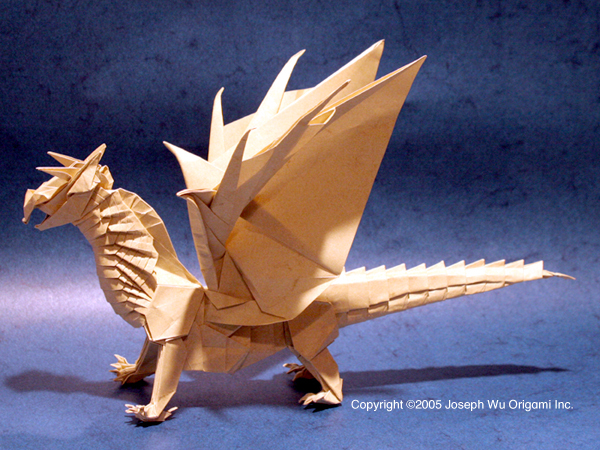 However, for those of you with better spactial awareness than I and a folding inclination, there are tutorials – not for every design, alas, but there is a tutorial on how to make an Origami Dragon. And once you’ve picked up the basics, who knows? Perhaps you could divise your own designs, as Joseph Wu has done. 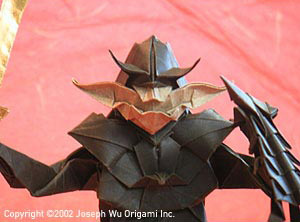 I’ve picked out my favorite Origami Monsters which you can see on this page – the Dragon, Goblin and Grell – but there are more to see in his gallery, so check it out. There’s Illithids, Demons, Beholders and all sorts!